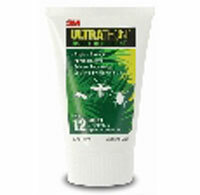 3M's Ultrathon is a polymer based, DEET insect repellent. DEET is the active ingredient in many repellents and is considered to be active against a wide range of pests including mosquitoes and ticks (including those which carry Lyme's Disease). The Ultrathon formulation contains 34% DEET in its lotion and spray formulation; the pump spray variant contains a lower lever - 25%. It incorporates a time release technology which means that the product evaporates slowly and so provides protection over a longer time period. (12 hours protection is claimed for the spray and lotion, 8 hours for the pump spray version which has the the lower level of DEET). I am someone who reacts quite extremely to insect bites - usually days of itchy swelling following even the smallest of bites. So I normally do need to use an insect repellent as soon as there's a hint of warm weather. I've been using all three Ultrathon variants in the last couple of weeks during day long walks in the Peak District (some near water) and even for gardening which is often a source of really annoying bites for me. The product doesn't have any perceptible odour at all and the one application in the morning has been all I needed to ensure a virtually bite free day - highly unusual for me. All the variants seem to to leave a slightly oily feel on the skin - but this does disappear after about half and hour so I didn't find this to be too much of a problem. I preferred the lotion formulation as there's less waste - and less random dispersal of the DEET product onto fabrics or car paintwork both of which I gather are prone to damage by any DEET product. My next challenge for Ultrathon will be during a forthcoming trip to Scotland ... no doubt plus midges. I shall report back! DEET based repellents may not be everyone's preference but if you're happy using one then the lower levels (in the pump spray) in the Ultrathon formulation is certainly a plus. Unusual in my experience is that there is also a lotion variant available - which I certainly prefer. In our testing Ultrathon was effective - so if insect bites are a problem for you and/or you're walking in areas where Ticks are active, have a look at Ultrathon.